Marti’s sense of color and design has become her trademark. Her watercolor batiks show her ability of mixing rich interesting jewel tones to soft pastels. She is able to capture the essence of light in her floral and landscapes as well as creates a calm presence to the viewer. Marti also paints bold acrylics in a modernistic, semi-abstract style, emphasizing on the Hawaiian lifestyle today. For 15 years she was the fabric stylist and colorist at Honolulu’s G. Von Hamm Textiles with a talented art department and felt too intimidated to try her hand at painting. When she left to become Hilo Hattie’s first art director in 1994 she discovered a talent in painting such lovely florals. Today she has her own company known as Art Directions. The company merchandises her art, does custom projects with interior designers and corporate clients, creates textile designs, and does home staging and decorating services. Her textile prints are often custom designed for hotel and restaurant uniforms and many have been part of garment manufacturer collections for years. 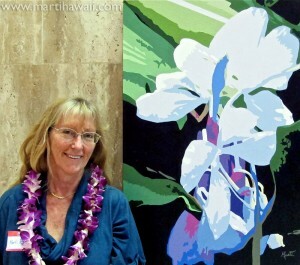 Marti has won several awards in juried art shows and is best known for her annual breathtaking exhibits at Kaneohe’s Ho’omaluhia Botanical Garden on Oahu. Her paintings have been reproduced on calendars, cards, t-shirts, mouse pads, coasters, wine and tote bags, and women’s silk apparel. She was raised in Honolulu and currently resides in Kailua’s lush Maunawili Valley on Oahu.